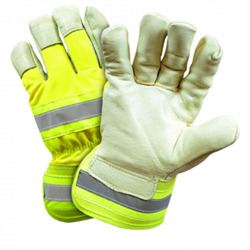 Premium grain pigskin leather palm glove with safety yellow back. Reflective material across cuff and knuckle provides excellent visibility in darkness and low-light conditions. Rubberized safety cuff.